Our starter guide for playing Elemental Mage in the early days of Rise of Shadows. Our Elemental Mage deck list guide features the best Rise of Shadows deck list for Season 61 of Hearthstone (April 2019). Our Elemental Mage guide also contains Mulligan advice, card combos and strategy tips. Elemental Mage is a Hearthstone deck that enjoyed a brief spurt of popularity right at the start of the Un'Goro meta, but never really came to dominate in the way that the Secret and Control archetypes came to do throughout 2017. The release of the Frozen Throne expansion introduced a couple of key cards for the archetype, with Frost Lich Jaina providing a significant boost to the deck's end-game potential. Kobolds didn't really do anything for the archetype at all, sadly, but The Witchwood introduced a few fun new tools to play with in the format. A lot has changed since then, however, and with the launch of Rise of Shadows many of those old cards are getting sent to Wild. There may be life for this deck in the new meta though, and so we've highlighted a theorycrafted deck list you can play around with at launch. During the busy launch period, we’re adding updated and alternative deck lists into all of our established guides so you have something new to play with in the new Rise of Shadows meta. Here’s Nicholena's take on Tempo Elemental Mage. Don't craft anything expensive until the deck's settled down and proved to be competitive! When we know what a refined version of the deck list looks like, we’ll be overhauling this article completely. Although it refers to an earlier version of Elemental Mage, you should still find the rest of this guide useful. Here's a version of Elemental Mage that we expect to be seeing competitive play in Hearthstone once Rastakhan’s Rumble launches. We'll be sure to update this list with any new changes or additions over the coming days. Elemental Mage vies for control of the board in the early game with minions and their usual array of high value spells, before moving into late game Elemental cards with impactful bonus effects and Battlecries. A number of new cards from the Rastakhan’s Rumble set have given this deck an extra burst of power that could see it rise up in the tier list. There are now more ways to get minions out for cheap using Elemental Evocation, for example, while Scorch and Arcanosaur provide some impressive removal effects that previous versions of the deck lacked. Together, they could make Elemental Mage much more competitive. Early game: Start to build up a board presence early with your cheaper Elemental minions such as Fire Fly and Pyros. The latter will steadily become a stronger minion as it dies throughout the game, so the sooner you can get that growing the better. Your Taunt minions are also well-positioned to slow down early aggression from your opponent. Big tempo plays are now open to Elemental Mage with the addition of two new cards in Rastakhan’s Rumble. Elemental Evocation will allow you to get some of your mid and late game minions onto the board earlier to put some serious pressure on your opponent, while Scorch is powerful removal at four damage for just one mana. You can pair that with a big discounted minion for a huge swing turn in the early game. Mid game: Some of your more powerful Elemental minions come into play at this stage of the game if you haven’t already been able to summon them at a discounted cost. Bonfire Elemental comes with a terrific draw effect that will keep your hand full of resources as you approach the late game, while Arcanosaur can be an excellent catch-up card if you’ve fallen behind on the board – just be mindful that it will hit your own minions too! In terms of your other cards, you may now be reaching a point where you have the correct hand size to play a Mountain Giant at a reasonable cost, and which will need to be dealt with quickly by your opponent. If you find yourself up against something just as significant on the other side of the board, you have Voodoo Doll as your hard removal tool that you can ping down as a five-mana combo. Late game: Elemental Mage also has a very strong late game waiting ahead of it if needed. If you’ve still maintained a large hand size, then Astromancer can generate you an impactful minion alongside it. Meanwhile, Blazecaller serves as strong removal, as well as a large body on your side of the board. Even further into the late game you can take advantage of Frost Lich Jaina to summon an army of Frost Elemental minions to overwhelm your opponent. Giving all of your Elemental minions, Lifesteal also gives you some ridiculous survivability into the late game, so take full advantage of that when played. There’s also a pretty good chance your hero power will have dealt eight damage by now, so when you play Jan'alai, the Dragonhawk you’ll also get a copy of Ragnaros the Firelord to help close out the match. 1. You should be able to contest the board right from the off with early game minions such as Fire Fly and Archmage Argual, so try to keep up with them if you can. 2. This deck also has a good package of early game Taunt creatures, such as Stonehill Defender and Tar Creeper which will really slow the progress of aggro decks. 3. If you do fall far behind on the board then Arcanosaur is an excellent way to catch up. You can even combine it with Elemental Evocation to play it on turn four if you feel like you're in danger of being rushed out of the match. 4. If you can get a Mountain Giant down early then you’ll be in a commanding position in the match, as aggro decks rarely have efficient ways to deal with larger minions. 5. Remember, Elemental Mage can also make big tempo plays with Scorch, allowing you to drop impactful Elemental minions on the board and then clear threats from your opponent's side for a significantly reduced cost. Use that to get ahead of aggro. 1. Elemental Mage is quite a balanced deck so should keep level with Control quite well, with enough draw and removal to stay in the game throughout. 2. You also have a surprisingly deep late game. Frost Lich Jaina is excellent late game reach with all the additional Elementals and the addition of Lifesteal, while Jan'alai, the Dragonhawk can be massively impactful when it summons Ragnaros the Firelord alongside it. 3. Voodoo Doll and your hero power is an excellent five-mana hard removal option. Make sure you save it for your opponent’s biggest threats. 4. The single version of Spellbreaker can also be used to deal with troublesome minions – especially ones that come with lots of additional keywords. 5. For even more late game reach, try to play Archmage Arugal when you know it’ll get some value. If you can get additional copies of your late game minions, you’ll be able to remain competitive for longer. Fire Fly: Good to get you on the board early and fills your hand with extra Elementals that can be played later as activators for your more impactful cards. Pyros: Another great early-game minion that grows in strength throughout the game. Book of Specters: A great source of early fuel, and you don't have too many spells to fall foul of the flipside of this card. Archmage Arugal: If you get it down early and it survives you can start building a healthy pool of extra minions. Tar Creeper: A very strong defensive card in the early stages of the game, capable of frustrating aggro opponents. Here are the combos that exist in this particular version of Elemental Mage. These should prove quite useful if you're completely new to this kind of archetype! - Tar Creeper only gains his extra damage during the opponent's turn, so factor that into your thinking when setting up a preferential board state. - You can ping your own Voodoo Doll to eliminate the nominated target. This has further synergy with Frost Lich Jaina as you'll gain a free Water Elemental as well once your transformation is complete! - Your Mountain Giant cards cost one Mana less for each card you have in your hand. You can use cards like Book of Specters to cheapen this creature up considerably. - With the deck’s card draw effects and additional minion generation, you can summon some reasonably powerful minions using Astromancer if you maintain a large hand size by turn seven. - The following cards require you to play an Elemental on your previous turn if you want to take advantage of their bonus effect: Bonfire Elemental, Scorch, Arcanosaur and Blazecaller. - In that context, consider holding back the bonus Elemental you receive from Fire Fly. It's a neat, cheap little enabler for an upcoming turn. - Additionally, the following cards will all be discounted by Elemental Evocation, but try to save it for the more expensive ones for more impactful tempo plays: Fire Fly, Pyros, Fire Plume Phoenix, Bonfire Elemental, Arcanosaur, Blazecaller. - Once you've transformed into Frost Lich Jaina, your new Hero Power allows you to do one point of damage, and it will also summon a Water Elemental if the target dies. Always look to open up opportunities to leave a one Health minion on the board for your next turn, and don't forget you can kill off your own minions too! Here are some of the key cards in Elemental Mage. Fortunately it’s quite a low cost deck in terms of dust, with some Epic and Legendary cards that can be substituted for cheaper alternatives. Elemental Evocation: Offers a significant discount on the many Elemental minions in the deck so you can get them down on the board as quickly as possible. Fire Fly: Excellent early game drop that also gives you a Flame Elemental in hand to use as an activator. Archmage Arugal: If it survives on the board for a turn or two you can start to stock up on some bonus minions for later in the game. Pyros: Works well as a cheap Elemental trigger in the early game, while also building its way up to a powerful late game minion. Scorch: New Rastakhan’s Rumble card offers some cheap removal that previous iterations of Elemental Mage was missing. You should be able to play it at a discount easily. Fire Plume Phoenix: Those stats are terrible, but the two damage Battlecry is massive for tempo, and it sets up your turn five play nicely. Zilliax: Offers a lot of flexibility, but is mostly good for catching you up and gaining you some board presence quickly if you’ve fallen behind. 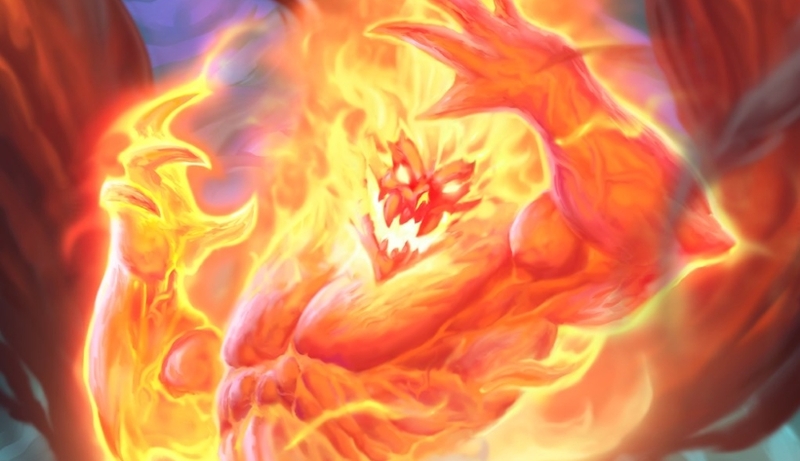 Bonfire Elemental: The hero of the deck from The Witchwood expansion remains a value machine and an absolute unit. Arcanosaur: Offers some powerful area of effect removal without the need to run Flamestrike, and while also playing into the deck’s Elemental synergy. A vital card for the deck. Astromancer: There’s a good chance you’ll have a large enough hand size to get some decent value out of Astromancer – especially with cards such as Book of Specters and Archmage Arugal in the deck. Jan'alai, the Dragonhawk: Slots neatly into the deck as another potential late game win condition although not absolutely necessary. If you want to save the dust consider any other high mana Legendary you likely own, such as The Lich King. Blazecaller: Another massive value machine. Like a buffed up Fire Elemental it comes into the board swinging with some hefty minion or face damage, and then remains a solid body on the field. Frost Lich Jaina: The synergy with all the deck’s Elemental minions is undeniable. The ability to summon extra Water Elemental creatures while giving them all Lifesteal gives you even more power in the late game.